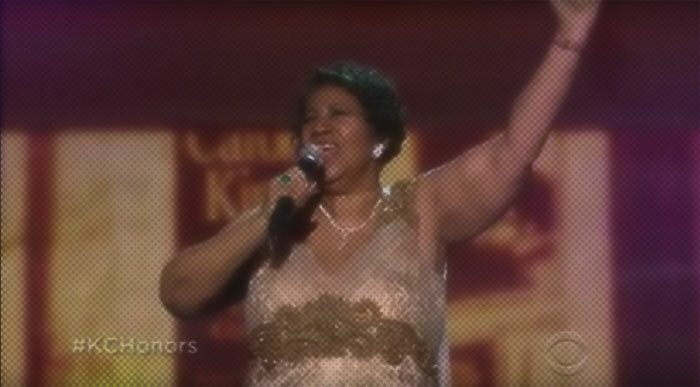 In a year of not so great Aretha Franklin performances, this one of (You Make Me Feel Like) A Natural Woman, recorded at the Kennedy Center Honors comes as a redeeming closer to 2015 for the Diva. Singing before a host of stars, including the American President, Aretha gave us a vocal that finally saw her break free from the curse that kept her channelling a forever boiling kettle and back delivering measured and musically astute performances. Sure, she wasn't scaling old heights (no sh*t, Sherlock, she's 73) but the voice was sounding mighty good. Watching Carol King lose her sh*t during it makes watching this worthwhile alone. Looks like she's back on side with the Queen of Shade Soul after that fiasco back in 1998. And I would be too- as long as those royalty checks from Aretha kept coming!